Acne, wrinkles, scars and dark circles are the embarrassing issues of beauty. These issues just not spoil your beauty of your face, it also damage your skin. The market is filled from the beauty products that challenge to reduce these problems, but these beauty products are expensive and most of them are chemical-based. Instead to buy expensive products, I am sharing my favorite face mask to treat acne, wrinkles, scars and dark circles. It’s made up of 100% natural ingredients. The star ingredients is turmeric, which has antioxidant and anti-inflammatory properties that help to fight wrinkles, soothe acne, promote healing, and lighten acne and its scars. Along with turmeric, honey, coconut oil and yogurt will be used in this face mask. Honey is great for moisturizing the skin, helps to reduce redness, inflammation and scars associated with acne. Coconut oil has antibacterial and antioxidant properties, great for maintaining younger-looking skin and helps to reduce scars and blemishes. Yogurt is rich in lactic acid that promotes skin’s pH level and removes dead skin cells. I do this facial once a week, for general skin-love, and whenever I feel a pimple coming on. You also apply this mask to nourish and hydrate your skin. 1. Take a bowl and put 1 tablespoon of yogurt in it. 2. Now add 1 teaspoon of raw honey. 3. Add now 1 teaspoon of extra-virgin coconut oil. 4. Finally add the (star ingredient) 1 to 3 teaspoons of organic turmeric powder in a bowl. 5. Mix well all the ingredients until it becomes lump-free paste with smooth consistency. 6. 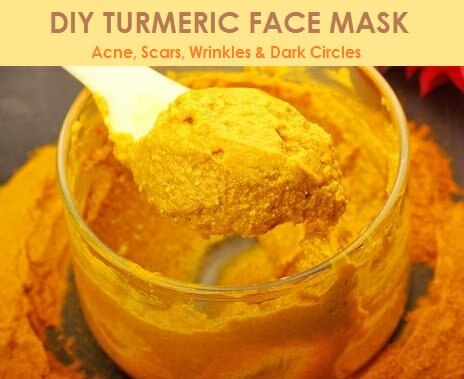 Your turmeric face mask is ready! 1. Wash your face first and pat it dry. 2. Apply the face mask on your face with your fingers or using a makeup brush. 4. Finally, wash your face with lukewarm water. 5. Apply this mask once a week to get perfect skin. Try to use Greek yogurt in this mask, because it has a thicker consistency. Always wash your hands first, before touching on your face. If you don’t know how to pop pimple, then you must avoid squeeze your acne, because it can lead scars. Cover your skin or apply sunblock before going to outside. Follow healthy diet and drink plenty of water regularly. Don’t use too much makeup and never sleep without removing your makeup. Wash your face morning and evening with gentle cleanser. You must sleep 7 to 8 hours to prevent dark circles and encourage healthy and glowing skin. Also, check out 5 DIY Body Scrubs for Glowing Skin here at @BeautyEnhancers.